I’m always on the hunt for healthy side dishes and ways to add more vegetables to my diet. Last Thanksgiving, I made this recipe for my mom, along with a stuffed turkey breast and roasted butternut squash soup. Both this recipe and the soup are available in my Flat & Happy Recipe Guide. It was absolutely delicious, and I can’t stop raving about it to friends and family! Even better, it was incredibly simple to make. Preheat oven to 400 degrees. On a baking sheet, drizzle broccolini with 2 tbsp olive oil; sprinkle with ½ tsp salt and toss to coat. Spread in a single layer. Roast, turning once with tongs until crisp-tender—about 10 to 15 minutes. If stems are not uniform in size, remove thinner ones to a platter once done. 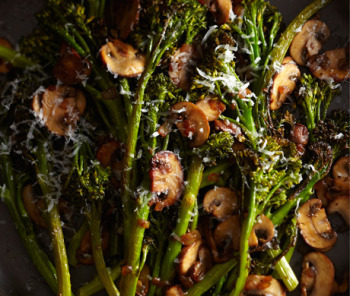 (Broccolini can be cooked hours in advance and kept at room temperature). In a large, deep frying pan, heat remaining oil over medium heat. Add onion and cook, stirring occasionally, until it starts to soften, about 5 minutes. Raise heat to medium high, add mushrooms and remaining salt and cook, stirring occasionally, until mushrooms are golden brown—7 to 10 minutes. Mushrooms will release liquid before reabsorbing it and browning. Add wine, cook until pan is dry—about 2 minutes. Stir in pepper.